Hip openers are, in my opinion, the most beneficial poses in a yoga asana practice. Coming from someone who has extremely tight hips, I love these poses for their potential to open me up both physically and mentally. For many of us, stress, fear, and anxiety live in our hips. This is the place where we bottle up tension and keep hold of old, negative thoughts and memories. Being able to release these things is an amazing experience. Start by lying on your back on your mat. Bring the soles of the feet to touch and let the knees fall open. Start breathing deeply, consciously sending breath to the hip creases. Start to ignite the energy within you and allow the hips to start to melt open. Place the left foot on the floor and cross the right ankle over the left knee. Gently pull the left leg towards you, lifting the left foot off the floor. Repeat on the other side. 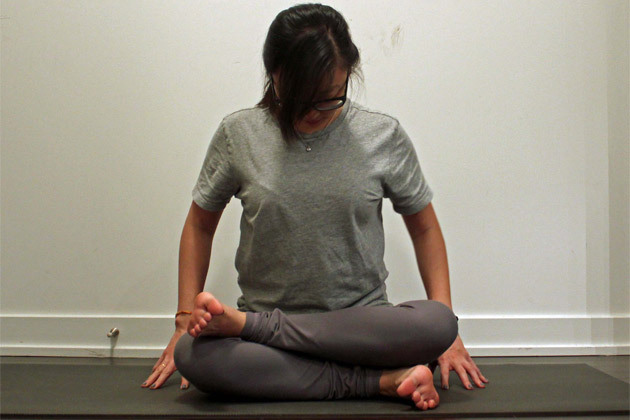 Sitting on bent legs, take the knees wide, keeping the feet together. Fold forward, stretching the arms out on the mat in front of you and lowering your third eye to the mat. You can play with walking the hands to either side of the mat to deepen the stretch. Step the right foot to the top of the mat, staying on the bent knee of the left leg. Reach the arms over head and engage the core. Melt into your hips, sinking as low as possible. Switch legs for the other side. From Low Lunge, lift your left knee off the mat and rotate the left foot 90 degrees so that the toes are now perpendicular to your mat and the arch of the left foot is in line with the heel of the right foot. Bend into your right knee, making sure the knee doesn't go past the ankle, and open your arms wide to the front and back of the mat. Imagine that you are trying to open your hips to run parallel with the left side of the mat while simultaneously bending the right knee straight over the second toe of the right foot. Repeat on the second side. Stand with your feet wide on your mat. Turn your toes out and your heels in. Begin to sink down into a squat. Pulse up and down to bring energy into the legs and hips. Then hold the squat to truly stretch the hips. From Downward Facing Dog, step the right foot forward and lower the knee directly behind the right hand. Lower down on to the left leg, trying to get the hips as close to the mat as possible. If that's too painful, prop yourself up on a yoga block or bolster. Either stay here, or fold forward bringing the arms and forehead to the mat. Hold for as long as feels blissful, or better yet, hold as long as it feels slightly uncomfortable. This pose can be tough for a lot of people, but it also creates enormous opening. From Pigeon, keep the right leg as is (parallel with the top of the mat). Swing the left leg around so it stacks on top of the right. If this is not possible, place a block or blanket under the left knee for support. Stay upright or forward fold for a deeper stretch. As with all yoga classes, move through this sequence at your own pace, paying very close attention to what your body tells you. Never work to pain, only go for what's reasonably comfortable. You may experience a lot of sensation, including slight discomfort in some of these poses, especially if your hips are tight. Just remember to stay mindful and be patient with yourself and your asana practice.